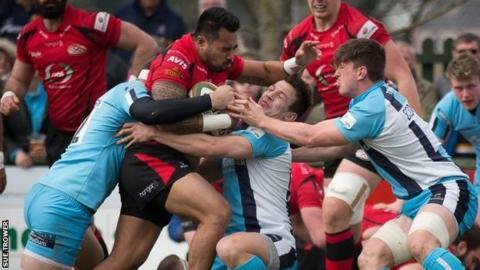 The president of the Jersey Football Combination says the league must change its fixture system to work around the island's rugby and cricket sides. Charlie Browne took over the role on Monday and has already overseen a change to the structure of the league. But he feels more people would watch football if it was scheduled away from Jersey Rugby Club's matches. "What we need to do is change the timing of our fixtures so we can go and watch these games," he told BBC Sport. Jersey Rugby Club averaged crowds of around 2,000 last season in English rugby's second tier. In March Jersey's top-of-the-table football clash between St Paul's and Jersey Scottish was on at the same time as the who went on to gain promotion back to the Premiership, in front of a season-high crowd of over 2,900. "Do we need three o'clock kick offs?" Browne, who has succeeded Tim Darwin after 14 years at the helm of the island's football league, added. "We have a different generation of footballers who have busy lifestyles, if they want an earlier kick off so they can play or watch rugby or cricket I'm all for it. "More thought is needed and I'll be working closely with Steve Landick the fixtures secretary."